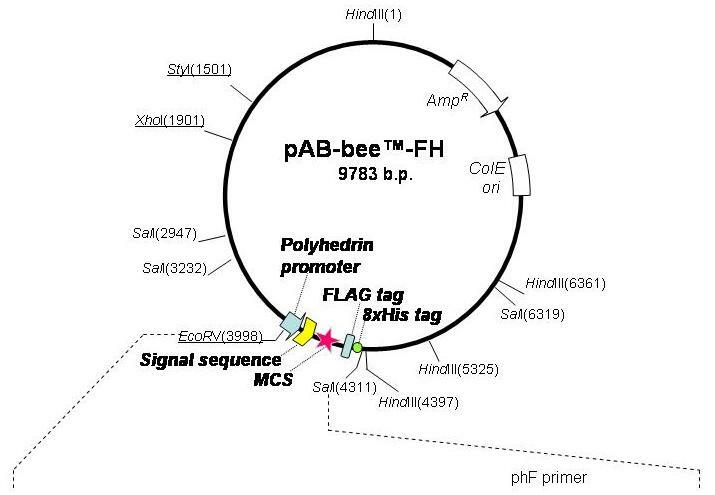 pAB-bee™-FH is a plasmid transfer vector which is recommended for expression of proteins "in fusion" with dual C-terminal FLAG-8xHis tag. This vector can be used for any proteins. However, it is especially useful for expression of secreted and transmembrane proteins as strong melittin signal sequence is encoded by the vector and can be provided on the N-terminus of the proteins to facilitate their efficient translocation into the ER of Spodoptera frugiperda cells (Tessier D.C. et al. Gene, 98:177-83, 1991). The signal sequence is followed by a signalase cleavage site and multiple cloning sites (MCS) for insertion of genes encoding proteins of interest in-frame with the signal sequence and the FLAG-8xHis tag. Polyhistidine tag allows convenient purification of proteins using immobilized metal affinity chromatography (IMAC), whereas highly charged FLAG tag facilitates exposure of the polyhistidine tag on the surface of the proteins and allows their convenient immunodetection with anti-FLAG antibodies. pAB-bee™-FH is designed to ensure both the translocation of the melittin signal-polyhistidine tag-foreign protein fusion product and efficient cleavage of the signal peptide in the ER. You can verify cleavage of the signal peptide in your fusion protein using TargetP program (Emanuelson O. et al., J.Mol.Biol., 300: 1005-10016, 2000). The program is user friendly and is available as a web-server at http://www.cbs.dtu.dk/services/TargetP/. 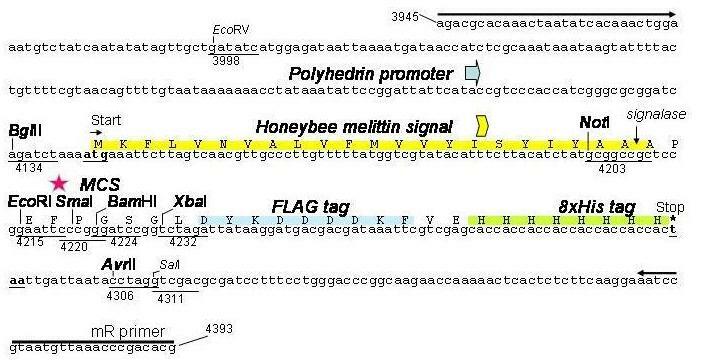 To this end, a PCR fragment encoding mature foreign protein can be cloned "in-frame" with the signal peptide and FLAG-8xHis tag into pAB-bee™-FH vector which is digested at any of the NotI, EcoRI, SmaI, BamHI, XbaI restriction endonuclease sites. Proteins also could be expressed without the mellitin signal sequence. To this end, an insert could be cloned into the vector that is double-digested at BglII site that precedes the sequence and any of the MCS sites of the vector. Positions of phF and mR primers, which are useful for sequencing the insert/vector junctions, are shown on the DNA sequence as arrows. The above plasmid transfer vector is compatible with linearized baculovirus DNA from several other suppliers, e.g. BacMagic™, BacMagic™-2, BacMagic™-3, BacVector™-1000, BacVector™-2000, BacVector™-3000 (Novagen); BaculoGold™, BaculoGold™ bright (BD Pharmingen); flashBACGOLD™, flashBACULTRA™, flashBAC™ (OET); BacPAK6™ (Clontech); Sapphire™ (Orbigen). They are not compatible with Bac-to-Bac® and BaculoDirect™ DNA from Invitrogen. BacMagic™, BacMagic™-2, BacMagic™-3, BacVector™-1000, BacVector™-2000, BacVector™-3000 are trademarks of Novagen; BaculoGold™, BaculoGold™ bright are trademarks of BD Pharmingen; flashBACGOLD™, flashBACULTRA™, flashBAC™ are trademarks of OET; BacPAK6™ is a trademark of Clontech; Sapphire™ is a trademark of Orbigen, Bac-to-Bac® and BaculoDirect™ are trademarks of Invitrogen. If you have not worked with baculovirus expression system, also referred to as baculovirus expression vector system or BEVS, you can get a quick update at TECHNOLOGY. Go to BACULOVIRUS TUTORIAL for simple on-line instructions on baculovirus transfection, propagation of recombinant baculoviruses and recombinant baculovirus protein expression studies. Click on PRODUCTS to view the entire list of recombinant baculovirus-related products.